The European Union through their commissioner for International Cooperation and Development, Neven Mimica has today signed a €75M package with the New Government of the Republic of The Gambia. 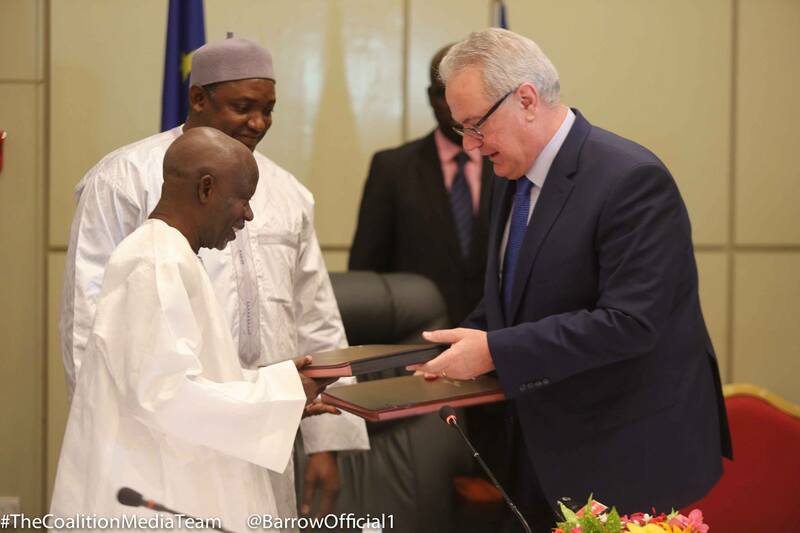 The huge sums of money from the European Union is to to help built the new Gambia in different projects. According to the 75 million euros of the financial relief package deal. 10.5 M Euros is expected to be pump in the Female household, Schools, Health Centers and road rehabilitation. 20.5 M euros for Road Constructions, Youth Employment and Better access to food. 11.5 M euros for Food Security, Prevention of malnutrition. 21.5 M euros for Climate Change support of civil society associations and finally the remaining 11M euros- Directly from Euro trust funds to increase job opportunities for Youths Let’s help Gambia to succeed. Commissioner Mimica has also announced today that the preparation of a second package of €150 million, which will be made available for medium and longer-term actions in favor of the Gambian population. An EU technical mission is visiting Banjul to identify and discuss areas of mutual interest. The EU-Gambia partnership has helped deliver important development goals for The Gambia, including for example the paving of nearly 50% of the Gambian road network through projects funded by the European Development Fund. Relations have also flourished in other areas such as trade, fisheries and tourism. The European Union’s total allocation for the Gambia under the 11th European Development Fund (EDF) for the period 2014-2020 was set at EUR 150 million. It was decided to start with an initial envelope (EUR 33 million for 2015-2016) to support the development priorities of The Gambia, as defined in the “Programme for Accelerated Growth and Employment” (PAGE 2012-2016). The main sectors of the first phase are Agriculture for economic growth and food security/nutrition and Exit strategy to the transport sector. With the new government in place, the key priorities of the EU in terms of development cooperation include rapidly supporting stability and reconstruction of the Gambian State. The Gambia also stands to benefit from the regional agenda of ECOWAS, whose priorities are focussed on five areas of intervention, notably, peace and security, infrastructure development, agriculture and resilience, common market and regional competiveness and capacity building. The Gambia also benefitted from the Environment budget line. A Global Climate Change Action project is being implemented in the area of integrated coastal zone management and climate change. Interventions in the areas of food security, agriculture and rural development, job creation, in particular for youth and women, as well as actions to support civil society organisations, democracy and human rights, are currently ongoing. The Gambia is eligible for the EU Emergency Trust Fund for stability and addressing root causes of irregular migration and displaced persons in Africa. Since the Valletta Summit, two new actions have been adopted in favour of Gambia for a total of EUR 14,9 million aiming, among others, to offering economic opportunities and jobs to reinforce the capacity of youth.